Hey guys I'm new to the Forum. This weekend I was at a local guitar shop and in the corner I saw a Mesa Boogie Mark III. I plug the amp in and tested it out and immediately purchased it. It's an early model 1985 Mark III that actually has the C+ Transformer as denoted by the + mark above the black stripe/no stripe power cord. 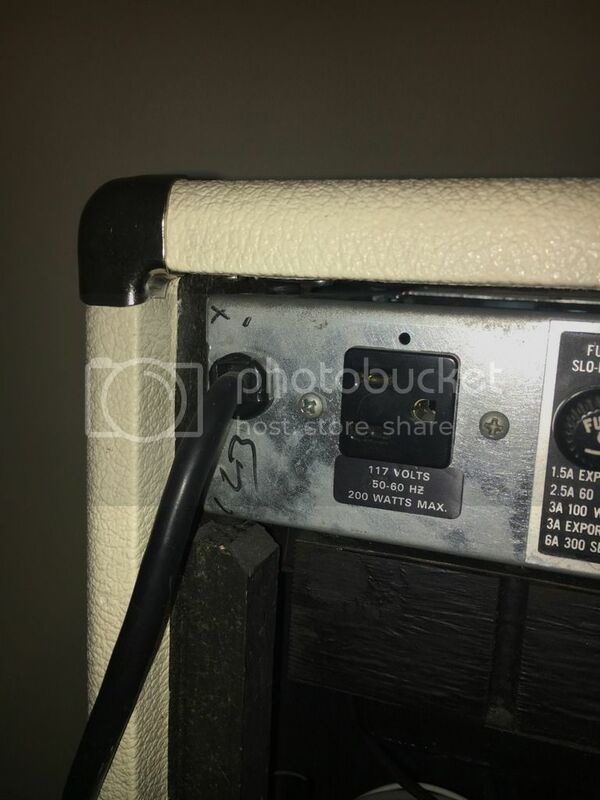 There are also some initials right below the power cord and I'm trying to figure out what letters are in the initials to figure out who did the final testing on the amp. Please take a look at the attached picture and let me know if you guys can decipher this. Looks very like Mike Bendinelli's signature, but missing the slight indent that makes a look B different from a D. So I'm going with him for final inspection. That X on the back just means no-stripe or black-stripe. Early one for sure, but you'll have to pull that back panel off to see what transformer is under there. Is it a 100/60 or Simul-class? Not sure about the 105PT on 100/60s? I have never seen a cab that size. Is it a really tall head or is there a tiny speaker in there? Is there any opening in that back panel for airflow? I wouldn't mind seeing a full back shot. s-fresh wrote: That X on the back just means no-stripe or black-stripe. Early one for sure, but you'll have to pull that back panel off to see what transformer is under there. Is it a 100/60 or Simul-class? Not sure about the 105PT on 100/60s? I have never seen a cab that size. Is it a really tall head or is there a tiny speaker in there? Is there any opening in that back panel for airflow? I wouldn't mind seeing a full back shot. It is a tall and narrow head. There is no speaker in the head. The head actually came with a wicker combo case. I am starting to think this is a custom case. It has a switch on the back that lets me run Simul Class (2xEl34 and 2x6L6) or Class A (2xEL34). How many watts is this? 15w/75w or 60w/100w? When I turn it on I can hear a cooling fan spin up and it appears there is a vented screen on the back. Also, look at the Logo. That is, mine says "Boogie" and most Mark III pictures have "Mesa Boogie"
Looks like the power transformer is not a 105 it is "561180" as seen in the very last picture. Why is there a small “x” and a small black dot to the right of it? Does each indicate something different? Mine has these exact same markings and I’ve always wondered why it has both. Can you take a picture of your markings and please post to this thread? jtwoods4 wrote: It is a tall and narrow head. There is no speaker in the head. The head actually came with a wicker combo case. I am starting to think this is a custom case. Looks like it's 561100 which is standard. 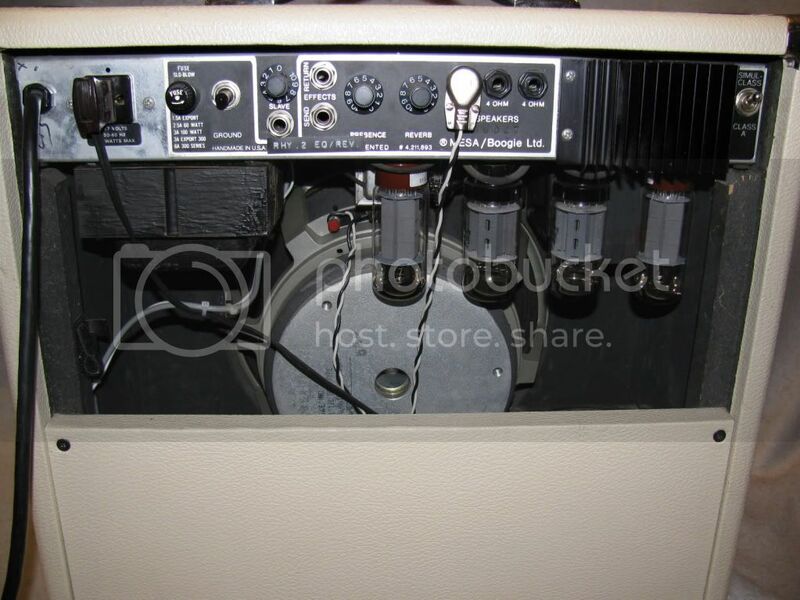 That Boogie logo is fairly common on early Mark IIIs as well, you see them both ways. It's 15/75. I've definitely never seen a head like that, must be a custom made job. Pretty neat, you could fit all kinds of stuff in there. I haven't seen a 105PT in a Mark III past 15,600 yet. Seanboy wrote: [Why is there a small “x” and a small black dot to the right of it? Does each indicate something different? My very limited understanding is everything from the start of Mark III production up until the Purple stripe is consider black/no stripe and basically the same circuit. Some earlier ones have the 105PT, but not all black/no stripes do. There may be more to it though. I've seen nothing, black line, black x, black dot, and some combo of them. There's a thread out there somewhere with information on how the stripes overlap with the serial numbers and there might be more information there. I have two early Mark IIIs with 105PT and both have a small vertical black line. s-fresh does your 105PT Mark III sound any different? I have been playing my Mark III for a few days now and its hard to believe that anything could sound better than this. I have been playing 25 years and have never heard an amp this awesome. Mine has the 105PT and has a very low 16,000 serial number. How different does that 105 sound compared to the standard Mark 3 Transformer? I swear to God I can't believe there could be another amp that could sound better than the early Mark 3 black stripe. Seanboy wrote: Mine has the 105PT and has a very low 16,000 serial number. I thought for sure that was a 100, not being very tall? I’ll have to take a look when I get home, I thought it was the 105PT, maybe I’m wrong.